The author of the book of Revelation struggled, as we do today, to live out a Christian faith in the context of an empire that trampled and destroyed the earth and its creatures. In this book, Micah D. Kiel will look at how and why Revelation was written, along with how it has been interpreted across the centuries, to come to an understanding of its potential contribution to a modern environmental ethic. While the book of Revelation is replete with images of destruction of the earth, Kiel shows readers, through Revelation's ancient context, a message of hope that calls for the care of and respect for the environment. Micah D. Kiel, PhD, is associate professor of theology at St. Ambrose University in Davenport, Iowa. He has a BA in music performance from Saint John's University, Collegeville, Minnesota, and an MDiv and PhD from Princeton Theological Seminary. He has published many articles and essays and is a frequent speaker in churches. He lives in Davenport with his wife and two children, with whom he enjoys travel, hiking, bike riding, baseball, and reading. "This book suggests that engagement with the book of Revelation can offer a radically different way of thinking and being which critiques these unthinking patterns of cultural behavior. The close attention which Kiel gives to the ecological imagery of Revelation offers a compelling matrix by which to understand the current global environmental catastrophes that threaten the flourishing of many species, our own included." "In this creative and absorbing study Micah Kiel makes a convincing case that the theology of this mystifying biblical book has a strong connection to the Christian view of creation and care for our `common home.'" "In this elegantly written and engaging book, Micah D. Kiel presents us with a kind of biography of the book of Revelation, moving from its content, ancestors, and original context, through its legacy (as seen in some of its later illuminated manuscripts) and onto its contemporary message in an age of environmental crisis. Kiel not only provides an accessible introduction to Revelation but also powerfully makes the case that John's critique of the ecological destructiveness of the Roman Empire can challenge us today—and can inform and shape a scientifically informed but radical response to the economic and environmental problems we face. The rich combination of historical contextualization, careful and critical interpretation, and informed contemporary reflection make this book an ideal stimulus to fresh thought, both about the book of Revelation (and Christian eschatology more generally) and about our contemporary environmental crisis." "In his innovative study of Revelation, Micah D. Kiel employs different strategies to show what Revelation's `apocalyptic ecology' can offer the environmental crisis. His most challenging question concerns the book's depiction of earth's destruction. How can a book where the sea is annihilated contribute positively to ecological consciousness? In the refusal of John of Patmos to diminish his critique of the Roman Empire, and it's devastating effect on the earth, lies Revelation's theocentric vision of nothing less than a new earth. "Revelation is not an anthropocentric book. The earth protects the woman from the dragon, and birds refuse to let evil have the last word. But humankind is not passive in the drama of John's eschatology. 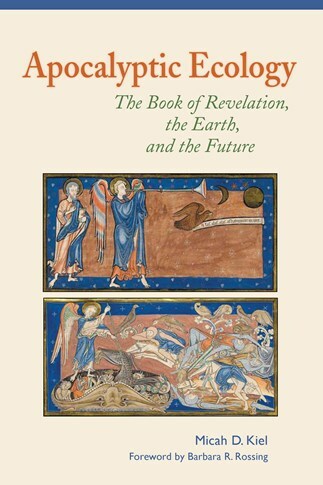 In his engaging eco-critical journey through the historical contexts that have formed John's theology to the illuminated manuscripts that depict Revelation's legacy, Kiel shows that Revelation's apocalyptic eschatology provides a robust call to ecological action. Biblical students and scholars alike will find in Apocalyptic Ecology much inspiration for ecological hope." "Kiel's work combines a rigorous study of Revelation and a creative dialogue between its response to the ecological situation in which it came into existence and what could be our response to the contemporary ecological crisis. All this written in a lively and accessible prose." "For many, the book of Revelation is self-evidently detrimental to environmental concerns. In this engaging and provocative book, full of rich insights on every page, Micah Kiel forces readers to think again. Once we allow that Revelation's terrifying vision of environmental catastrophe is more descriptive than prescriptive, an ancient visionary response to deforestation and water and air pollution, new possibilities open up for us. Kiel skillfully uncovers dimensions of Revelation that reveal humanity's connectedness to the earth, to animal and vegetable life, dimensions acknowledged by many of the book's medieval illuminators. He challenges us to swallow our anthropocentric pride and enter into its vision in which nonhuman animals lead the way to a proper orientation of the cosmos. Most important, he unleashes Revelation's surprisingly rich potential for developing a contemporary, theocentric ecology."